Pubali Bank Limited has inaugurated its Renovated `Chairman�s Secretariat�, `Board Room� and `MD�s Secretariat�. Habibur Rahman, Chairman, Board of Directors of Pubali Bank Limited inaugurated the Renovated `Board Room� along with other Members of Board of Directors. Vice-Chairman Moniruddin Ahmed; Directors- Monzurur Rahman, Rumana Sharif, Arif A. Choudhury, Asif A. Choudhury, Azizur Rahman, Md. Abdur Razzak Mondal, M. Kabiruzzaman Yaqub, Independent Director Shahdeen Malik and M. Azizul Huq and Managing Director Md. Abdul Halim Chowdhury were present. Pubali Bank Ltd. inaugurates ATM Booth at Bangladesh Agricultural University, Mymensingh to provide modern and digital banking service for the valued customers. Professor Dr. Md. Ali Akbar, VC of Agricultural University formally inaugurated the booth as Chief Guest. Professor Dr. Md. Jasimuddin Khan, Pro-VC of Agricultural University and Md. Abdul Halim Chowdhury, Managing Director & CEO of Pubali Bank Ltd. were present as Guest of Honour. Safiul Alam Khan Chowdhury, Additional Managing Director and Mohammad Ali, Deputy Managing Director of the bank were present as Special Guests. DGM and RM of Mymensingh region Md. 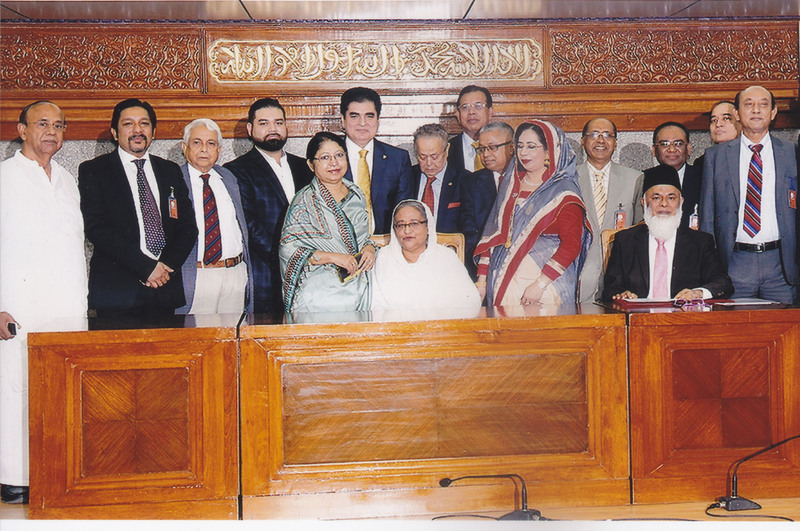 Rafiqul Islam presided over. Teachers, Students & Officials of the University and Senior Executives of the bank were also present. The �1st Managers� Conference-2019� participated by all Managers of Rangpur Region was held recently to motivate them to increase Bank�s business by rendering better services. Md. Abdul Halim Chowdhury, Managing Director of Pubali Bank Ltd. graced the conference as Chief Guest. Mohammad Ali, Deputy Managing Director of the bank was present as Special Guest. DGM and RM of Rangpur region Md. Kamruzzaman presided over the conference. In his speech Chief Guest Md. Abdul Halim Chowdhury emphasized on expansion of foreign remittance business through better customer & modern banking service. He also advised all to work hard, look for new business avenues and adopt diversification and to take concerted efforts for achieving the target fixed for the year 2019. He stressed on selection of potential borrower and try to enhance bank business. He emphasised on recovery of overdue, classified and write off loan on priority basis. He advised branch managers to keep close vigilence so that newly disbursed loans may not become overdue or classified by intensive supervision and close monitoring of the loan. In his speech Special Guest Mohammad Ali advised all to work hard to increase remittance rendering best customer services. He underscored the need for increased utilization of the modern Information Techninlogy for qualitative improvement in the overall customer service of PBL as the bank has to operate in a highly competitive Banking sector. Performance of the branches also evaluated in the meeting and necessary strategy and plans were taken to achieve the target fixed for the year 2019. The 1st Managers� Conference- 2019 of Chattogram South Zone of Pubali Bank Limited held recently. Md. Abdul Halim Chowdhury, Managing Director & CEO of Pubali Bank Ltd. graced the conference as Chief Guest. Akhtar Hamid Khan- Deputy Managing Director of the Bank was present as Special Guest. Habibur Rahman, General Manager of Chattogram Principal Office presided over the conference. In his speech Md. Abdul Halim Chowdhury emphasized on expansion of foreign remittance business through better customer & modern banking service. He said, �The economy of Bangladesh is expanding as the world economy is doing the same. Banking sector is playing the lead role here. He urged all to work sincerely in this competitive banking sector. Mr. Chowdhury stressed on selection of potential borrower and try to enhance bank business. He also advised all to work hard, look for new business avenues and diversification and to take concerted efforts for achieving the target fixed for the year 2019. In his speech Akhtar Hamid Khan stressed on selection of potential borrower and try to expand bank business. He advised all officers to abide by the rules and regulations of Bangladesh Bank and other regulatory bodies since we are a very compliant bank. At the conference, necessary strategies and plans were framed to achieve the target fixed for the year 2019. DGM & Regional Head of Chattogram South Zone Mohammad Monjurul Islam Mojumder, DGM & Regional Head of Chattogram North Zone Naresh Chandra Basak and Branch Managers of Chattogram South Zone & Agrabad Corp. Branch were also attended at the conference. The 1st Managers� Conference- 2019 of Chattogram North Zone of Pubali Bank Limited held recently. Md. Abdul Halim Chowdhury, Managing Director & CEO of Pubali Bank Ltd. graced the conference as Chief Guest. Akhtar Hamid Khan- Deputy Managing Director of the Bank was present as Special Guest. Habibur Rahman, General Manager of Chattogram Principal Office presided over the conference. In his speech Md. Abdul Halim Chowdhury emphasized on expansion of foreign remittance business through better customer & modern banking service. He said, �The economy of Bangladesh is expanding as the world economy is doing the same. Banking sector is playing the lead role here. He urged all to work sincerely in this competitive banking sector. Mr. Chowdhury stressed on selection of potential borrower and try to enhance bank business. He also advised all to work hard, look for new business avenues and diversification and to take concerted efforts for achieving the target fixed for the year 2019. In his speech Akhtar Hamid Khan stressed on selection of potential borrower and try to expand bank business. He advised all officers to abide by the rules and regulations of Bangladesh Bank and other regulatory bodies since we are a very compliant bank. At the conference, necessary strategies and plans were framed to achieve the target fixed for the year 2019. DGM & Regional Head of Chattogram North Zone Naresh Chandra Basak, DGM & Regional Head of Chattogram South Zone Mohammad Monjurul Islam Mojumder and Branch Managers of Chattogram North Zone & CDA Corp. Branch were also attended at the conference. 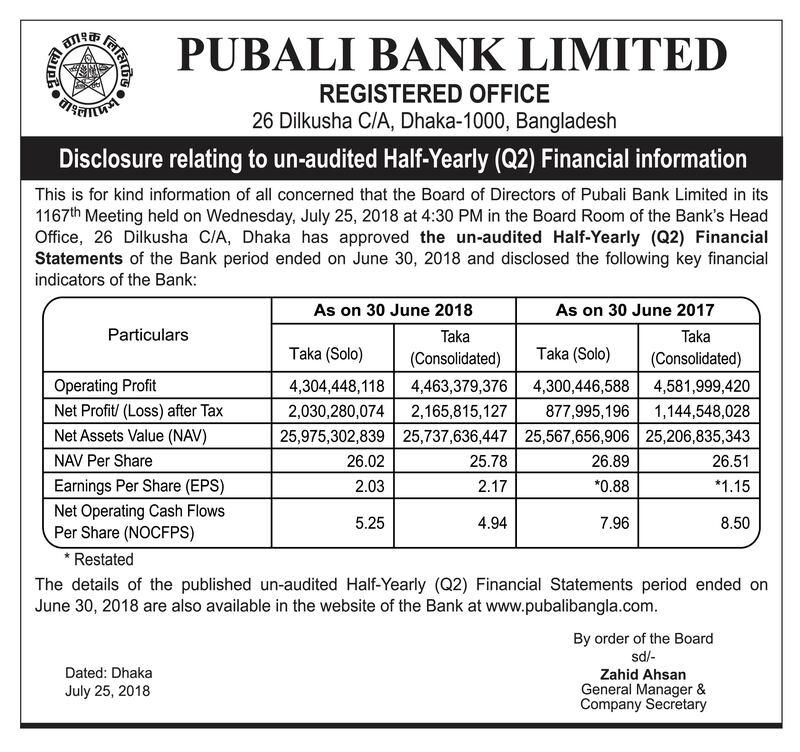 Safiul Alam Khan Chowdhury has been re-appointed as Additional Managing Director of Pubali Bank Limited for 03 (three) years. He has been serving as Additional Managing Director since 01 January 2016. Prior to his appointment as Additional Managing Director Safiul Alam Khan Chowdhury was the Deputy Managing Director. He started his banking career as Senior Officer with Pubali Bank Ltd. in 1983, selected through the Bankers Recruitment Committee of Bangaldesh Bank. He was the General Manager of different Division of Head Office of the Bank and also served as Head of different Corporate Branches & Regional Head of Dhaka North Region of the Bank. Safiul Alam Khan Chowdhury took part in various seminars, symposiums, workshops and training programs at home and abroad. He completed his graduation and post-graduation from the University of Dhaka. An �Orientation Program� has been arranged recently for newly recruited Armed Guards in Pubali Bank Ltd. at Bank�s auditorium. Md. Abdul Halim Chowdhury, Managing Director & CEO of Pubali Bank Ltd. was present as Chief Guest at the ceremony. Additional Managing Directors- Muhammad Mijanur Rahman Joddar and Safiul Alam Khan Chowdhury; Deputy Managing Director - Mohammad Ali were present as Special Guests. General Manager of HRD Ahmed Enayet Manzur presided over the program. Pubali Bank Limited, the largest private commercial bank of the country has been awarded as the highest tax-payer in the banking category under the large tax payers� unit in 2017-18 tax year. Finance Minister Abul Maal Abdul Muhith recently handed over the crest and tax card to Habibur Rahman, Chairman, Board of Directors of Pubali Bank Limited at a ceremony held at Sonargaon Hotel. Safiul Alam Khan Chowdhury, Additional Managing Director of Pubali Bank Ltd. was present at that time. State Minister for Finance and Planning M A Mannan MP, FBCCI President Md. Shafiul Islam (Mohiuddin) and Md. Mosharraf Hossain Bhuiyan, Chairman of National Board of Revenue(NBR) were present at that time. A training course on �Foundation Training for Senior Officers & Officers� was held recently under the auspices of Pubali Bank Training Institute. Md. Abdul Halim Chowdhury, Managing Director of Pubali Bank Ltd. graced the occasion as Chief Guest in the inaugural ceremony. Niranjan Chandra Gope, Principal of Pubali Bank Training Institute, presided over the function. In his speech Md. Abdul Halim Chowdhury made a clarion call on all participants to foster new spirit and enthusiasm for achieving our Bank�s Vision and Mission. He reiterated on the challenging tasks for all for ensuring profitability and strength of the bank. He put forward his views on being Compliant Ethical Bank making our position excellent and envious. He made instruction to them to make all-out efforts to make proper investment of fund, to reduce classification of loan and to arrest mismanagement in the operational activities of the bank with a view to maintaining efficiency and effectiveness in all respects. He urged all Officers to work with honesty and integrity in the workplace. 29 (twenty nine) Officers of the bank participated in the Training Course. A training course on �Fire Safety Training & Fire Drill� organized by Pubali Bank Limited Establishment Division held recently at bank�s head office auditorium. Muhammad Mijanur Rahman Joddar, Additional Managing Director-1 of Pubali Bank Ltd. was present at the ceremony as Guest of Honour. Deputy Managing Director Akhtar Hamid Khan presided over the training course. Iftikher Haider, Deputy General Manager of Establishment Division was also present. The �2nd Managers Conference-2018� participated by all Managers of Mymensingh Region of Pubali Bank Limited was held recently to motivate them to increase Bank�s business by rendering better services. Md. Abdul Halim Chowdhury, Managing Director of Pubali Bank Ltd. graced the conference as Chief Guest. Mohammad Ali, Deputy Managing Director of the bank was present as Special Guest. DGM and RM of Mymensingh region Md. Rafiqul Islam presided over the conference. In his speech Chief Guest Md. Abdul Halim Chowdhury emphasized on expansion of foreign remittance business through better customer & modern banking service. He also advised all to work hard, look for new business avenues and adopt diversification and to take concerted efforts for achieving the target fixed for the year 2018. Managing Director stressed on selection of potential borrower and try to enhance bank business. He emphasised on recovery of overdue, classified and write off loan on priority basis. He advised branch managers to keep close vigilence so that newly disbursed loans may not become overdue or classified by intensive supervision and close monitoring of the loan. Performance of the branches also evaluated in the meeting and necessary strategy and plans were taken to achieve the target fixed for the year 2018. 2nd Managers� conference-2018 of Dhaka North of Pubali Bank Limited was held recently.Md. Abdul Halim Chowdhury, Managing Director & CEO graced the conference as Chief Guest. Mohammad Ali, Deputy Managing Director was present as Guest of Honour. Dewan Ruhul Ahsan and Dewan Jamil Masud- General Managers of Head Office were present as Special Guests.. General Manager and RM of Dhaka North Region Md. Humayan Kabir, presided over the conference. Branch Heads of Dhaka North Region were present at the conference. Managing Director Md. Abdul Halim Chowdhury emphasized on expansion of foreign remittance business through better customer & modern banking service. He also advised all Regional Managers & Branch Managers to work hard, look for new business avenues and adopt diversification and to take concerted efforts for achieving the target fixed for the year 2018. He urged upon all the executives to keep close vigilance so that newly disbursed loans may not become overdue or classified. Intensive supervision and close monitoring of the loan should be made. As a part of Corporate Social Responsibility (CSR) Pubali Bank Ltd. donated an Ambulance to Dhaka National Medical Institute Hospital. Md. Abdul Halim Chowdhury, Managing Director of Pubali Bank Limited handed over the Ambulance to Kazi Firoz Rashid, Chairman of Dhaka National Medical Institute Hospital & Member of Parliament from Dhaka-6. Muhammad Mijanur Rahman Joddar, Additional Managing Director; Mohammad Ali and Akhtar Hamid Khan- Deputy Managing Directors of Pubali Bank Limited and Dr. Captain (Retd.) M. A. Salam, Director, Dhaka National Medical Institute Hospital and Professor Dr. Mostaque Ahmed, Principal, Dhaka National Medical College were present. Abu Habib Khairul Kabir, General Manager of General Services and Development Division and A. S. Sirajul Haque Chowdhury, General Manager and Regional Head of Dhaka South Region of Pubali Bank Ltd. along with other Sr. Executives of both organizations were also present. Chairman of Dhaka National Medical Institute Hospital Kazi Firoz Rashid praised such activities of Pubali Bank. In his speech Md. Abdul Halim Chowdhury said, Pubali Bank is not only a profit oriented organization; it has some social responsibility. As a part of it, Pubali Bank donated an Ambulance to Dhaka National Medical Institute Hospital. He cited that such activities will be continued. A training course on �Foundation Training for Senior Officers & Officers� was held recently under the auspices of Pubali Bank Training Institute. Md. Abdul Halim Chowdhury, Managing Director of Pubali Bank Ltd. graced the occasion as Chief Guest in the inaugural ceremony. Niranjan Chandra Gope, Principal of Pubali Bank Training Institute, presided over the function. In his speech Md. Abdul Halim Chowdhury made a clarion call on all participants to foster new spirit and enthusiasm for achieving our Bank�s Vision and Mission. He reiterated on the challenging tasks for all for ensuring profitability and strength of the bank. He put forward his views on being Compliant Ethical Bank making our position excellent and envious. He made instruction to them to make all-out efforts to make proper investment of fund, to reduce classification of loan and to arrest mismanagement in the operational activities of the bank with a view to maintaining efficiency and effectiveness in all respects. He urged all Officers to work with honesty and integrity in the workplace. 30 (thirty) Officers of the bank participated in the Training Course. The Board of Directors of Pubali Bank Limited has recently appointed Muhammad Mijanur Rahman Joddar as Additional Managing Director-1 of the Bank. Prior to his appointment, Muhammad Mijanur Rahman Joddar was the Executive Director of Bangladesh Bank. He started his banking career as Officer Class One with Bangladesh Bank. He has almost thirty two years� job experiences in Bangladesh Bank. Muhammad Mijanur Rahman Joddar completed his graduation and post-graduation in Finance from the University of Dhaka. He completed his MBA in Management Information System (MIS) from the University of New Orleans, USA. He also obtained Post Graduate Diploma in Bank Management from BIBM. Muhammad Mijanur Rahman Joddar has experience as Observer of Bangladesh Bank in the Board Meeting of Agrani Bank Ltd. & Al-Arafah Islami Bank Ltd. He took part in various seminars, symposiums, workshops and training programs at home and abroad. Eminent Industrialist and social worker Moniruddin Ahmed has been elected as Vice-Chairman of the Board of Directors of Pubali Bank Ltd. and Eminent Industrialist and social worker Syed Moazzem Hussain has been elected as Vice-Chairman and Chairman of Executive Committee of the Board of Directors of Pubali Bank Ltd. in its 1162nd Board Meeting. Mr. Moniruddin Ahmed is a renowned businessman and engaging himself with various social activities. He has been working relentlessly to upgrade the education status of Sylhet. He is the founder Chairman of Monir Ahmed Academy. He is the Chairman of Pubali Bank Securities Limited. Mr. Syed Moazzem Hussain is a renowned businessman and engaging himself with various social activities. He is the Chairman of Prince Corporation Ltd. and Moazzem Knit & Dyeing Industries Ltd. He was the Chairman of the Board of Directors of Delta Life Insurance Company Ltd. He is the Chairman of Executive Committee of Pubali Bank Ltd. He is the founder of Hollying Berry Syed Moazzem Red Crescent Hospital in Barishal. He is also the founder of Syed Moazzem Red Crescent Clinic and Halima Moazzem School in Jhalokati. Pubali Bank Ltd. holds 35th Annual General Meeting (AGM). The 35th Annual General Meeting (AGM) of Pubali Bank Limited was held at bank�s auditorium on May 10, 2018. Habibur Rahman, Honourable Chairman, Board of Directors of Pubali Bank Limited presided over the meeting. The Shareholders unanimously approved 5% Cash & 5% Stock Dividend for the year ended 31st December 2017 in the 35th Annual General Meeting (AGM). A huge number of Shareholders actively participated in the discussion & they talked about the overall performance of the Bank in the AGM. They expressed their satisfaction & also suggested some suggestions for further improvement of performance of the bank. Hon�ble Chairman thanked everybody for active participation in the AGM and then announced the end of the meeting. Chairman of Pubali Bank Ltd. Re-elected for 02(two) years. The 35th Annual General Meeting (AGM) of Pubali Bank Limited was held at bank�s auditorium on May 10, 2018. Chairman of the Board of Directors of Pubali Bank Ltd. was re-elected unanimously in its 1161st Board Meeting after Annual General Meeting. Eminent Industrialist and social worker Habibur Rahman has been re-elected as Chairman of the Board of Directors of Pubali Bank Ltd. for 02(two) years. Mr. Habibur Rahman is a renowned businessman and engaging himself with various social activities. He is the sponsor Director of Green Delta Insurance, Delta Hospital & Delta Medical Center. He was born in a noble Muslim family in Sylhet. Pubali Bank Limited honoured with plaque by the Centre for NRBs. Pubali Bank Limited has been honoured with plaque entitled `Top Ten Remittance Award� for remarkable support service to increase the flow of inward foreign remittance and �Financial Branding Award 2018� for outstanding services and participation to increase the economic image of the country in abroad from the Centre for Non-Resident Bangladeshis (NRBs). Deputy Managing Director Mohammad Ali on behalf of Pubali Bank Limited received the award from Nurul Islam BSc, Honorable Expatriates' Welfare and Overseas Employment Minister. MS Shekil Chowdhury, Chairperson of the Centre for NRBs presided over the function. Pubali Bank Ltd. signs MoU with BRAC Services Ltd.
A Memorandum of Understanding (MoU) between Pubali Bank Limited and BRAC Services Ltd. has been signed recently at bank�s Head Office. Md. Abdul Halim Chowdhury, Managing Director & CEO; Safiul Alam Khan Chowdhury, Additional Managing Director and Mohammad Ali, Deputy Managing Director of Pubali Bank Ltd. and Khondoker Asaduzzaman, Group General Manager of BRAC Services Ltd. were present at the MoU signing ceremony. Ashim Kumar Roy, DGM & Head of Cards of Pubali Bank Limited and Nasim-ul Haque Chowdhury, Head of Sales of BRAC Services Ltd. signed the MoU on behalf of their respective organizations. Halima Khatoon, DGM of Card Division of Pubali Bank Limited was also present on the occasion. Under this MoU, all Debit & Credit Card holders and Employees of Pubali Bank Limited will avail 20% discount on Room tariff and 15% discount on Food along with other facilities. Pubali Bank Limited Board of Directors� has donated Tk.5 (five) crore to the Honourable Prime Minister�s Relief & Welfare fund as a part of corporate social responsibility. Habibur Rahman, Chairman, Board of Directors of Pubali Bank Ltd. handed over a donation cheque of Tk. 5 (five) crore to Sheikh Hasina, Hon�ble Prime Minister at Ganabhaban in the capital recently. Md. Abdul Halim Chowdhury, Managing Director & CEO of Pubali Bank Ltd. was also present on the occasion. Pubali Bank Limited recently signed an agreement with Bangladesh Bank (BB). Under this agreement, Pubali Bank will be able to utilise Two Step Loan fund for its customers provided by Japan International Co-operation Agency(JICA). Md. Abdul Halim Chowdhury, Managing Director & CEO of Pubali Bank Limited and Md. Rezaul Islam, General Manager of Bangladesh Bank signed the agreement on behalf of their respective organizations. Governor of Bangladesh Bank Fazle Kabir, Chief Representative of JICA Bangladesh Office Takatoshi Nishikata, Deputy Governor of Bangladesh Bank Abu Hena Mohd. Razee Hassan and Executive Director of Bangladesh Bank Ahmed Jamal along with other senior officials from both the organizations were also present on the occasion. As a part of Corporate Social Responsibility (CSR) the Board of Directors of Pubali Bank Ltd. donated a Pick-up (Toyota Brand) to Dhaka Metropolitan Police (DMP). Md. Abdul Halim Chowdhury, Managing Director of Pubali Bank Limited handed over the key of the pick-up to Md. Asaduzzaman Mia, Commissioner of Dhaka Metropolitan Police (DMP). Safiul Alam Khan Chowdhury, Additional Managing Director and Abu Habib Khairul Kabir, General Manager of General Services and Development Division of Pubali Bank Ltd. along with other Sr. Executives of both organizations were also present. Md. Asaduzzaman Mia, Commissioner of Dhaka Metropolitan Police (DMP) praised such activities of Pubali Bank and said that other organizations should participate in such activities. In his speech Md. Abdul Halim Chowdhury said, Pubali Bank is not only a profit oriented organization; it has some social responsibility. As a part of it, Pubali Bank donated a Pick-up for use of Dhaka Metropolitan Police (DMP). He cited that such activities will be continued. Pubali Bank Limited signed a participatory agreement with Bangladesh Bank (BB) on Second Small & Medium Sized Enterprise Development Project (SMEDP2) at the conference room of BB recently. With the financial support of Asian Development Bank (ADB) and the Government of Bangladesh, the agreement was signed under the refinance scheme of US$ 240 million to expand financial services for the development of Cottage, Micro, Small & Medium Enterprises (CMSME). Md. Abdul Halim Chowdhury, Managing Director & CEO of Pubali Bank Limited and Md. Abul Bashar, General Manager of Financial Inclusion Department of Bangladesh Bank signed the agreement on behalf of their respective organizations. S.K. Sur Chowdhury, Deputy Governor of Bangladesh Bank was present in the ceremony as chief guest while Cai Li, Deputy Country Director of ADB and Pradip Kumar Datta, General Manager of Credit Division of Pubali Bank Limited along with other senior officials of both the organizations were also present on the occasion. Pubali Bank Limited Board of Directors� has donated 50,000 blankets to the Honourable Prime Minister�s Relief fund as a part of corporate social responsibility to distribute among the cold-hit poor people of the country. Habibur Rahman, Chairman, Board of Directors of Pubali Bank Ltd. handed over a sample of the blankets to Sheikh Hasina, Hon�ble Prime Minister at Prime Minister�s Office in the capital recently. Md. Abdul Halim Chowdhury, Managing Director of Pubali Bank Ltd. was present at the occasion. Here mentionable that, Pubali Bank Limited is very much committed to the Corporate Social Responsibility (CSR). Social responsibility is designed to respond for the greater interest of the society. Pubali Bank Ltd. plays a significant role in any natural calamity of our country in the past as a part of their corporate social responsibility. Date: 27 November , 2017. Pubali Bank Limited has inaugurated its 458th branch at Melandaha Bazar, Jamalpur having online banking facilities with a view to provide modern banking service. State Minister for Textile and Jute Mirza Azam MP was present as Chief Guest and formally inaugurated the branch. Md. Abdul Halim Chowdhury, Managing Director & CEO of Pubali Bank Ltd. was present as Guest of Honour. Safiul Alam Khan Chowdhury, Additional Managing Director and Mohammad Ali, Deputy Managing Director of the bank were present as Special Guests. DGM and RM of Mymensingh region Md. Rafiqul Islam presided over the ceremony. Branch Manager, local elites & businessmen also attended at the inaugural ceremony. Date: 17 October , 2017. Pubali Bank Ltd. donates Tk. 05(Five) Crore to PM�s Relief Fund to help Rohingya. Pubali Bank Limited Board of Directors� has donated Tk. 05(Five) Crore to the Honourable Prime Minister�s Relief fund for the Rohingya as a part of corporate social responsibility. Fahim Ahmed Faruk Chowdhury, Vice-Chairman, Board of Directors of Pubali Bank Ltd. handed over a donation cheque of Tk. 05(Five) Crore to Sheikh Hasina, Hon�ble Prime Minister at her office in the capital recently. Moniruddin Ahmed, Director of Pubali Bank Ltd. was present at the occasion. Date: 12 February , 2017. Pubali Bank Ltd. holds 1st Managers� conference-2017 of Barisal Region. The �1st Managers� Conference-2017� participated by all Managers of Barisal Region of Pubali Bank Ltd. was held recently to motivate them to increase Bank�s business by rendering better services. Md. Abdul Halim Chowdhury, Managing Director of Pubali Bank Ltd. graced the conference as Chief Guest. Safiul Alam Khan Chowdhury, Additional Managing Director of the bank was present as Special Guest. DGM and RM of Barisal region Md. Zahidur Rahaman presided over the conference. In his speech Md. Abdul Halim Chowdhury emphasized on expansion of foreign remittance business through better customer & modern banking service. He also advised all to work hard, look for new business avenues and adopt diversification and to take concerted efforts for achieving the target fixed for the year 2017. He emphasized on expansion of the business at a very competitive price. He underscored the need for increased utilization of the modern Information Techninlogy for qualitative improvement in the overall customer service of PBL as the bank has to operate in a highly competitive Banking sector. Additional Managing Director Safiul Alam Khan Chowdhury stressed on selection of potential borrower and try to enhance bank business. He emphasised on recovery of overdue, classified and write off loan on priority basis. He advised Regional head and Branch managers to keep close vigilence so that newly disbursed loans may not become overdue or classified by intensive supervision and close monitoring of the loan. Performance of the branches also evaluated in the meeting and necessary strategy and plans were taken to achieve the target fixed for the year 2017 . Date: 19 January , 2017. Pubali Bank Ltd. holds 1st conference-2017 of Regional and Corporate Branch Managers . The 1st conference- 2017 of Regional and Corporate Branch Managers of Pubali Bank Limited held at bank�s head office today. Md. Abdul Halim Chowdhury, Managing Director and CEO of the bank presided over the conference. Additional Managing Director Safiul Alam Khan Chowdhury, Deputy Managing Directors - Mohammad Ali and Akhtar Hamid Khan were present at the conference. General Managers, all Regional & Corporate Heads and other Senior Executives of Head Office were also present. In his speech Managing Director Md. Abdul Halim Chowdhury emphasized on expansion of foreign remittance business through better customer & modern banking service. He also advised all to work hard, look for new business avenues and diversification and to take concerted efforts for achieving the target fixed for the year 2017. In his speech Safiul Alam Khan Chowdhury stressed on selection of potential borrower and try to expand bank business. He advised all officers to abide by the rules and regulations of Bangladesh Bank and other regulatory bodies since we are a very compliant bank. At the meeting, necessary strategies and plans were framed to achieve the target fixed for the year 2017. Date: 08 November , 2016. Date: 03 November , 2016. Pubali Bank Ltd. holds 4th conference-2016 of Regional and Corporate Branch Managers. The 4th conference- 2016 of Regional and Corporate Branch Managers of Pubali Bank Limited held at bank�s head office today. Habibur Rahman, Chairman, Board of Directors of Pubali Bank Limited was present as Chief Guest. Azizur Rahman, Vice-Chairman and Syed Moazzem Hussain, Director of Pubali Bank were present as Special Guests. Md. Abdul Halim Chowdhury, Managing Director of the bank presided over the conference. Additional Managing Director Safiul Alam Khan Chowdhury, Deputy Managing Directors - Md. Sayeed Ahmed FCA, Mohammad Ali and Akhtar Hamid Khan; General Managers, all Regional & Corporate Heads and other Senior Executives of Head Office were present at the conference. In his speech Habibur Rahman emphasized on expansion of foreign remittance business through better customer & modern banking service. He also advised all to work hard, look for new business avenues and diversification and to take concerted efforts for achieving the target fixed for the year 2016. In his speech Md. Abdul Halim Chowdhury stressed on selection of potential borrower and try to expand bank business. He advised all officers to abide by the rules and regulations of Bangladesh Bank and other regulatory bodies since we are a very compliant bank. At the meeting, necessary strategies and plans were framed to achieve the target fixed for the year 2016. Date: 02 November , 2016. Pubali Bank Limited Board of Directors� has donated Tk. 20(Twenty) Lac to Dhaka Bar Association for the construction of a four bed primary clinic as a part of corporate social responsibility. Md. Abdul Halim Chowdhury, Managing Director of Pubali Bank Ltd. recently handed over a donation cheque of Tk. 20(Twenty) Lac to Md. Saidur Rahman Manik, President of Dhaka Bar Association. Mohammad Ali, Deputy Managing Director & Chief Technical Officer of the Bank, General Manager and RM of Dhaka South Region Md. Sirajul Islam Miah, General Manager of Head Office Abu Habib Khairul Kabir, General Secretary of Dhaka Bar Association Md. Ayubur Rahman, former President and General Secretary of Dhaka Bar Association and Officials of Pubali Bank Ltd. were present on the occasion. Here mentionable that, Pubali Bank Limited is very much committed to the Corporate Social Responsibility (CSR). Social responsibility is designed to respond for the greater interest of the society. Date: 27 October , 2016. A Follow up Meeting with the CLS Agents on Consumers Credit Scheme organized by Pubali Bank Limited Consumers Credit Division was held recently at bank�s head office auditorium. Md. Abdul Halim Chowdhury, Managing Director and CEO of Pubali Bank Ltd. was present as Chief Guest at the meeting. Additional Managing Director Safiul Alam Khan Chowdhury was present as Guest of Honour. Deputy Managing Directors - Md. Sayeed Ahmed FCA, Mohammad Ali and Akhtar Hamid Khan were present as Special Guests. General Manager of Head Office M. Shahnawaz Chowdhury was also present. Md. Belayet Hossain, DGM & Division Head of Consumers Credit Division presided over the meeting. Date: 23 October , 2016. Date: 19 October , 2016. Pubali Bank Limited has inaugurated its shifted Gulshan Model Town Corporate Branch with a view to providing best & modern banking services to its valued customers. Habibur Rahman, Chairman, Board of Directors of Pubali Bank Limited was present as Chief Guest at the inaugural ceremony. Vice-Chairman Azizur Rahman, Directors- Moniruddin Ahmed, Syed Moazzem Hussain, Monzurur Rahman, Ahmed Shafi Choudhury, M. Kabiruzzaman Yaqub and Rana Laila Hafiz were present as Special Guests. Managing Director Md. Abdul Halim Chowdhury presided over the ceremony. Former Chairman of Pubali Bank Ltd. and Chairman of Bangladesh Red Crescent Society Hafiz Ahmed Mazumder, Former Chairman of BTRC Syed Margub Murshed and Former Director of Pubali Bank Ltd. M. Faizur Rahman were also present among others. In his speech Chairman Habibur Rahman said that Pubali Bank is committed to provide the best & innovative banking services needs of the market in fastest possible time. As a part for providing better services & clients� increasing demand Pubali Bank has shifted Gulshan Model Town Corporate Branch. In his speech Md. Abdul Halim Chowdhury said that Pubali Bank has been providing better services for its customer since 1959 with a promise to keep up its original tradition. He also said, Pubali Bank gives priority to provide opportunity and advantage to the customers through application of modern technologies. With a view to expanding the scope of services, the bank has shifted its Gulshan Model Town Corporate Branch. He advised to accelerate the daily activities of the branch and urged all officers to enhance bank business. Additional Managing Director Safiul Alam Khan Chowdhury, Deputy Managing Directors - Md. Sayeed Ahmed FCA, Mohammad Ali and Akhtar Hamid Khan; Senior Executives of the bank, Gulshan Model Town Corporate Branch Head & DGM Mohammad Anisuzzaman, valued customers, local elites & businessmen also attended at the inaugural ceremony. A workshop on �Management Development Program� was held recently under the auspices of Pubali Bank Training Institute. A workshop on �Management Development Program� was held recently under the auspices of Pubali Bank Training Institute. Md. Abdul Halim Chowdhury, Managing Director of Pubali Bank Ltd. graced the occasion as Chief Guest on the Inaugural ceremony. Niranjan Chandra Gope, Principal of Pubali Bank Training Institute, presided over the function. In his speech Md. Abdul Halim Chowdhury made a clarion call on all participants to foster new spirit and enthusiasm for achieving our Bank�s Vision and Mission. He reiterated on the challenging tasks for all for ensuring profitability and strength of the bank. He put forward his views on being Compliant Ethical Bank making our position excellent and envious. He made instruction to them to make all-out efforts to make proper investment of fund, to reduce classification of loan and to arrest mismanagement in the operational activities of the bank with a view to maintaining efficiency and effectiveness in all respects. Pubali Bank Ltd. holds 2nd conference-2016 of Regional and Corporate Branch Managers. The 2nd conference- 2016 of Regional and Corporate Branch Managers of Pubali Bank Limited held at bank�s head office today. Hafiz Ahmed Mazumder, Chairman, Board of Directors of Pubali Bank Limited was present as Chief Guest. M. Kabiruzzaman Yaqub and Azizur Rahman- Directors of Pubali Bank were present as Special Guests. Md. Abdul Halim Chowdhury, Managing Director of the bank presided over the conference. Additional Managing Director Safiul Alam Khan Chowdhury, Deputy Managing Directors - Md. Sayeed Ahmed FCA, Mohammad Ali and Akhtar Hamid Khan; General Managers, all Regional & Corporate Heads and other Senior Executives of Head Office were present at the conference. In his speech Hafiz Ahmed Mazumder emphasized on expansion of foreign remittance business through better customer & modern banking service. He also advised all to work hard, look for new business avenues and diversification and to take concerted efforts for achieving the target fixed for the year 2016. Pubali Bank Limited honoured with a plaque by the Centre for NRBs. Pubali Bank Limited has been honoured with a plaque entitled `Top Ten Remittance Award� from the Centre for Non-Resident Bangladeshis (NRBs) for remarkable support service to increase the flow of inward foreign remittance.The award has been given at the inaugural ceremony of World Conference Series 2016 at a city Hotel recently. Managing Director Md. Abdul Halim Chowdhury on behalf of Pubali Bank Limited received the award from M A Mannan MP, State Minister for Finance and Planning. Pubali Bank Ltd. recommended for 12% Cash Dividend for the year 2016. Normal trading of the shares of the Company will resume on 04.04.2016 after record date. Trading of the shares of the Company will remain suspended on record date i.e., 03.04.2016. The Board of Directors has recommended 12% cash dividend for the year ended on 31.12.2015. Date of AGM: 28.04.2016, Time: 10:30 AM, Venue: Pubali Bank Auditorium, Head Office, 26 Dilkusha C/A, Dhaka-1000. Record Date: 03.04.2016. The Company has also reported Consolidated EPS of Tk. 3.34, Consolidated NAV per share of Tk. 27.48 and Consolidated NOCFPS of Tk. 2.87 for the year ended on 31.12.2015 as against Tk. 3.54, Tk. 25.14 and Tk. 3.28 respectively for the year ended on 31.12.2014. Board of Directors of the Bank approved the Balance Sheet for 31 December-2014. It also recommended for 10% Cash Dividend. It further decided that the bank�s 32nd Annual General Meeting (AGM) will be held on Tuesday, March 31, 2015 at 9.00 A.M. at PSC Convention Hall, Police Staff College, Mirpur-2014, Dhaka. Date: 23 February , 2015. Md. Abdul Halim Chowdhury has been appointed as new Managing Director of Pubali Bank Limited. He was the Managing Director (Current Charge) of the bank since 7th December 2014. Prior to his appointment Md. Abdul Halim Chowdhury was Additional Managing Director of the Bank. He joined in Pubali Bank Ltd. as Principal Officer in 1988. He was Deputy Managing Director of the Bank and also served as General Manager of Credit Division, Head of different Corporate Branches & Regional Head of Dhaka Central Region of the Bank. Date: 22 February , 2015. The 1st Managers� conference- 2015 of Dhaka South Region of Pubali Bank Limited held in the city recently. Md. Abdul Halim Chowdhury, Managing Director of Pubali Bank Limited was present as Chief Guest. Deputy Managing Director of the Bank Safiul Alam Khan Chowdhury was present as Special Guest. GM and RM of Dhaka South Region Md. Sirajul Islam Miah presided over the conference. In his speech Md. Abdul Halim Chowdhury emphasized on expansion of foreign remittance business through better customer & modern banking service. He said, �The range of the economy of Bangladesh is increasing as world economy is doing the same. Banking sector is playing the lead role here. He urged all to work sincerely in this competitive banking sector. Mr. Chowdhury stressed on selection of potential borrower and try to enhance bank business. He also advised all to work hard, look for new business avenues and diversification and to take concerted efforts for achieving the target fixed for the year 2015. Date: 10 February , 2014. Pubali Bank Limited has inaugurated its 425th branch at Mawna, Gazipur. Pubali Bank Limited has inaugurated its 425th branch at Mawna, Gazipur. Hon�ble Chairman, Board of Directors of Pubali Bank Ltd. Hafiz Ahmed Mazumder formally inaugurated the branch. Pubali Bank�s Managing Director of Pubali Bank Helal Ahmed Chowdhury, Chairman of Envoy Group Qutubuddin Ahmed, Mawna Union Parishad Chairman Md. Fazlul Haque, Company Secretary of Pubali Bank Ltd. Md. Sayeed Sikder, Genaral Manager & Dhaka North Region Head Dewan Jamil Masud, General Manager B.M. Shahidul Hoque are also seen. 1st conference-2014 of Regional and Corporate Branch Managers of Pubali Bank held. The 1st conference - 2014 of Regional and Corporate Branch Managers was held at bank�s head office today 25 January 2014. Hafiz Ahmed Mazumder, Chairman, Board of Directors of Pubali Bank was present as chief guest while Managing Director Helal Ahmed Chowdhury presided over the meeting. Directors of Pubali Bank Syed Moazzem Hussain, M. Kabiruzzaman Yaqub, Additional Managing Director M.A. Halim Chowdhury are also seen in the photograph. Managing Director and CEO of Pubali Bank Ltd Helal Ahmed Chowdhury pose for photograph along with newly promoted Asst. General Managers. Additional Managing Director M. A. Halim Chowdhury and other General Managers also seen in the photograph.